The shoulder injury to young quick Jhye Richardson may create an Ashes opportunity for Queensland swing bowler Michael Neser, who is fresh from a career-best Sheffield Shield season. Australia made the mistake on recent Ashes tours of not picking a specialist swing bowler to exploit the English Dukes ball, which offers far more movement through the air than the Kookaburra. While their batting line-up was undone time and again by the canny swing of English veteran James Anderson, Australia used aggressive, express quicks like Mitchell Johnson and Mitchell Starc. Neither of those Australian bowlers proved to be well suited to the conditions in England, where accuracy and swing are more effective than speed and bounce. Australia surely this time around will select their fast bowlers based on their suitability to English conditions. Richardson, despite never having played a first-class match in the UK, certainly appears to be the kind of paceman who should prosper there. 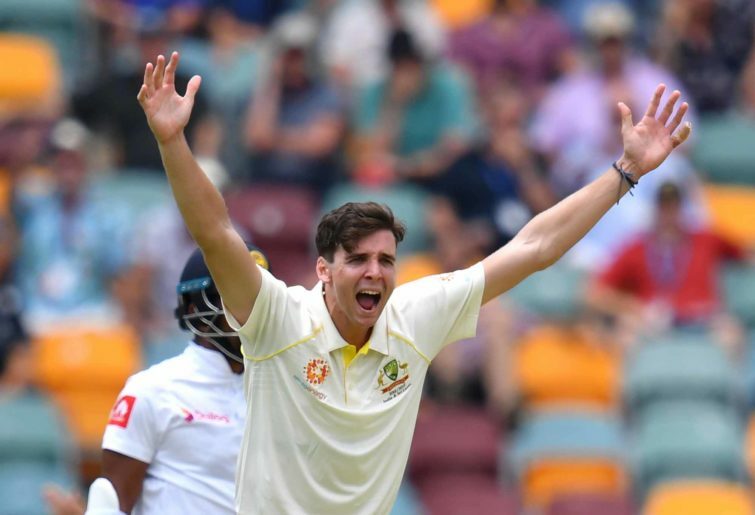 In his debut Test series against Sri Lanka this summer, the 22-year-old operated with wonderful precision and swung the ball further and more consistently than any Aussie Test quick has for years. If he is fit and in form Richardson may well deserve a spot in Australia’s starting XI for the Ashes, perhaps ahead of either Starc or Josh Hazlewood. But Richardson first has to make a comeback from a serious injury, having dislocated his shoulder while fielding in the ODIs in the UAE this month. If Richardson does not recover smoothly from this issue then it is Neser who should take his place as the specialist swing bowler in Australia’s Ashes squad. The 29-year-old Neser has made a name for himself as a wizard with the Dukes ball, having taken 54 wickets at 20 with that ball over the past three Sheffield Shield seasons. The Dukes has been used in the second half of each of those seasons and this has corresponded with Neser’s best bowling form. A natural swing bowler, Neser can get the Dukes to hoop in both directions, a rare skill among current Australian quicks. Neser’s only direct competitors, in terms of this specific skill, are Richardson and South Australians Chadd Sayers and Daniel Worrall. But neither Sayers nor Worrall have the same momentum as Neser at this point, for different reasons. Worrall missed most of the second half of the Shield season due to a hamstring injury, while Sayers’ first-class form has plummeted in the past two years. After long dominating with the red ball, Sayers has taken just 36 wickets at 34 in that time. In this same period Sayers made an uninspiring Test debut in South Africa. Granted, it was the fourth Test and Australian cricket has just been ripped apart by the ball tampering scandal in the previous match. Sayers, however, just did not look like a Test bowler. The most damning aspect of his performance was that he did not bowl badly – he was very accurate and frugal, operating just like he does at Shield level. His style just did not translate to Test level, with the South African batsmen looking at complete ease against his gentle swingers, as he bowled mostly in the 118-125kmh range. Sayers was brought in to the Test team to replicate the bowling of South African Vernon Philander. It wasn’t to be. While Philander took 9-51 in that Test, Sayers managed just 2-146 and was the most unthreatening bowler from either team. Aside from recent bowling form, Neser also has one crucial attribute Sayers and Worrall don’t – generous batting ability. The Queenslander has become a genuine all-rounder over the past three years, making 1,163 runs at 31 in that time, including 10 fifties. With England boasting the strongest tail in Test cricket, the Australian selectors may well take into account the collective batting ability of any bowling attack they choose. So Neser’s talent with the blade, coupled with his sensational stats using the Dukes ball, make him a very attractive option for the Ashes.